A Subject Transcript lists courses by subject, instead of by year. This type of transcript makes it easy for college scholarship and admissions personnel to quickly see all the courses completed in each subject. Please note: It is important to list the name of the requirement the course fulfilled, not the name of the textbook used. 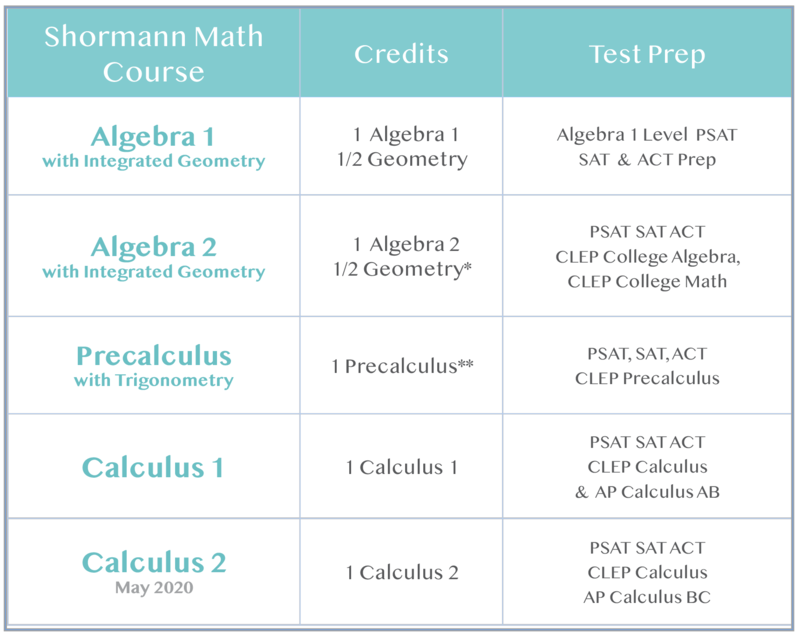 Because Saxon and our new Shormann Interactive Math integrate algebra and geometry, they provide excellent preparation for the PSAT, SAT, and ACT, as well as CLEP and AP exams. 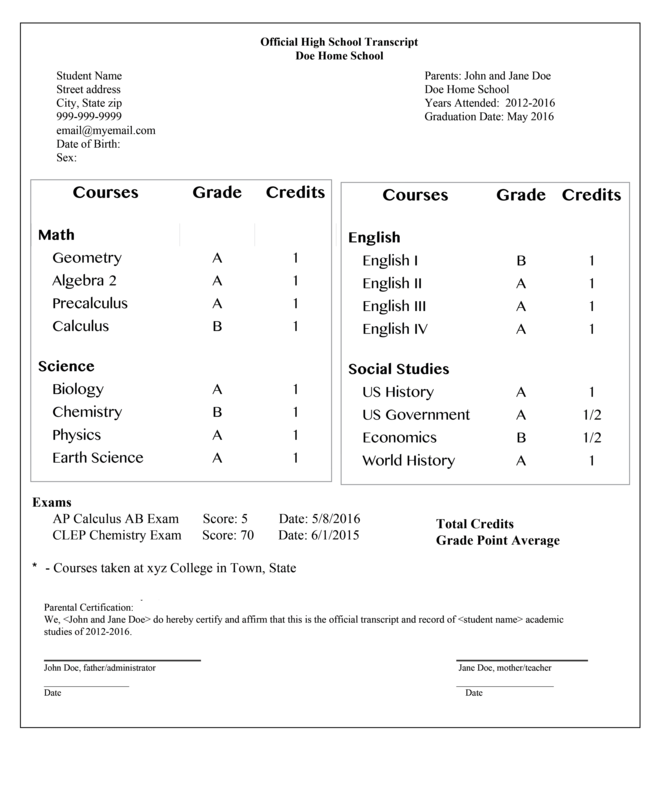 However, parents are sometimes confused about how to list these credits on a high school transcript. As you can see below, a subject transcript makes it easy. Limit math credits to a total of four credits. For example, if Calculus is completed in high school, five high school math credits have been completed. Only list the last four credits, as shown in the sample below. If Precalculus is the last math course completed, list Algebra 1, Algebra 2, Geometry, and Precalculus. Scroll down to learn more about math credits earned in each Saxon and Shormann Math course. CLEP and AP exams are another important component for college admissions and scholarships. Not only do these exams help you earn college credit, they also validate your transcript and demonstrate college readiness. According to The College Board, a passing score on the AP Calculus exam is the number one indicator of college success. List all passing CLEP and AP Exams at the bottom of the transcript as shown on the sample transcript above. You will also send a request to the College Board to send your official scores to the college. To list a course as AP in the main credit section of the transcript, each teacher (or home school parent) must submit their syllabus for approval from the College Board. However, listing a class as AP on the transcript is usually not very beneficial to homeschoolers. 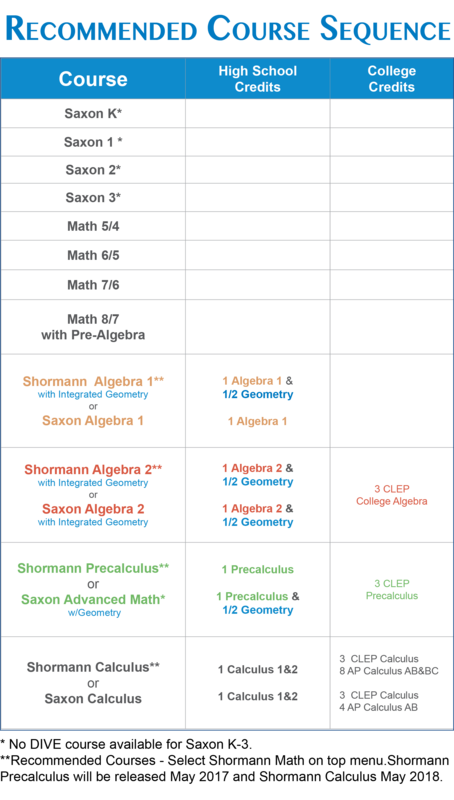 The primary benefits are realized by passing the AP Exam, which can be listed at the bottom as shown in the sample above. You can read more about AP Exams here. Our CLEP Professor series provides expert instruction for select CLEP and AP exams. These three to six week courses are used after completing the corresponding high school course and include video lectures, practice problems with video solutions, practice exams, and Q&A email support with Dr. Shormann. While a high school transcript is necessary, it is mportant to remember that the most important criteria for college admission, is usually PSAT, SAT, and ACT scores. If a student is denied college admission, it is almost always due to a low score on the math section. So don't overemphasize the transcript. Focus on using a good math curriculum that will develop fluency in both algebra and geometry and prepare students for the new redesigned PSAT and SAT exams. Learn more about PSAT, SAT, and ACT Preparation.